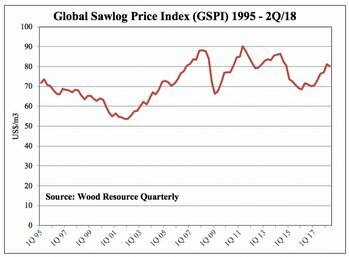 The Global Sawlog Price Index (GSPI) fell 1.4% in the 2Q/18. This was the first q-o-q decline since the 4Q/16. Sawlog prices fell on all continents (in US dollar terms) except for North America, where prices in the 2Q/18 were up 3.3% from the previous quarter and up 14.5% from the 2Q/17. The European Sawlog Price Index (ESPI-€), which fell slightly in the 2Q/18, has been quite stable during 2017 and 2018, fluctuating between just over €85/m3 and mid-€86/m3. In the 2Q/18, both wood fiber price indices fell for the first time in five quarters, mainly because of the strengthening of the US dollar against currencies in all countries covered by the WRQ. 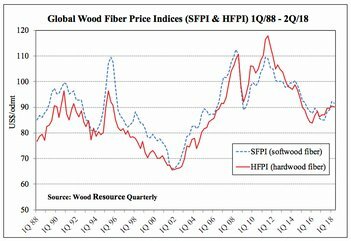 The 2Q/18 Global Softwood Fiber Price Index (SFPI) decreased slightly from the 1Q/18 but was still 7.8% higher than the same quarter in 2017. Quarter-over-Quarter, softwood fiber prices fell the most in Brazil, Russia, Sweden and New Zealand. Lower prices for hardwood log in Brazil, Russia, Sweden, Australia and Spain, together with price increases in Indonesia, US Northwest, Japan and Chile, resulted in a practically unchanged Global Hardwood Fiber Price Index (HFPI) in the 2Q/18 as compared to the previous quarter. Prices for NBSK pulp in Europe continued their unprecedented two-year long increase to reach just over $1220/ton in July. Current NBSK prices are up by almost 50% as compared to July of 2016. During the first half of 2018, shipments of pulp have gone up on all continents, except in North America, as compared to the same period in 2017. Worldwide trade of lumber has inched up again in early 2018, hinting that this may be another year with record high trade of lumber. Six of the ten largest lumber-exporting countries in the world have increased their shipments in 2018. Lumber prices in the US have been on a roller coaster ride over the past year, with sharp increases during the 2H/17 and early 2018 followed by plunging prices during the summer months of 2018. Lumber exports from Finlandwere up 8.7% in 2017 from 2016 but fell by 3.5% during the first four months of 2018 as compared to the same period in 2017. Russia supplied China with record volumes of softwood lumber in the 2Q/18, while imports from the US and Europe were down from the 1Q/18. Softwood lumber import volumes to Japan were up 6.7% q-o-q, reaching almost 1.6 million m3 in the 2Q/18. This was the second highest quarterly import volume in four years. In the 2Q/18, profits for sawmills in North America reached their highest levels since at least 2005. In Europe, the gross margins in early 2018 were close to the highest they have been in four years in the Nordic countries, while they reached levels not seen in over a decade in other parts of the continent. Global trade of wood pelletshas been on a steady upward trajectory over the past decade with the major trading occurring between North America and Europe. Prices for residential wood pellet in the three major markets of Europe (Austria, Germany and Sweden) have converged in the past year and were practically the same in the 2Q/18.